Axel Hotels is the first hotel chain to cater specifically for the LGBTI community, with a marketing hook I really love: “hetero-friendly hotels”. Their philosophy? To create spaces of diversity conceived for and open to all, where everybody feels truly welcome. The centrally located Axel Madrid opened a few months ago, at 49 Calle Atocha, determined to become a benchmark. But, of course, if you are part of the LGBTI community, you will be able to see and feel lots of signs, some more subtle than others. Nothing goes unnoticed, from the moment you walk along the hallway leading to reception. Particularly striking are the décor of many of its rooms, the neon lights lighting up the area between the entrance and the central courtyard, the rigorously cutting-edge pastel colours, and its wonderful terrace, complete with heated pool for cooling down in the summer with a tomato juice that blends perfectly with the sea of red roof tiles in the Barrio de las Letras (Literary Quarter): it doesn’t get much more authentic than this. 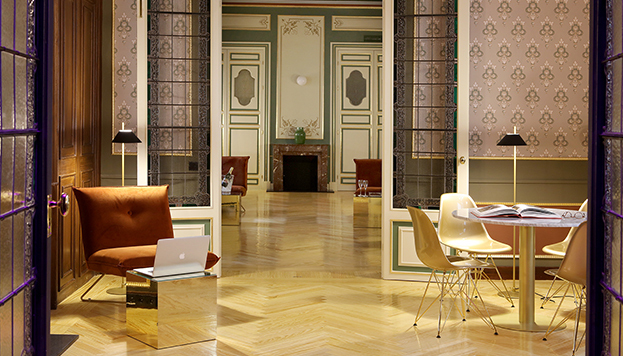 This 80s look is a perfect fit for the emblematic 19th-century building that houses this hotel. The main floor retains the building’s original design, thanks to its having been painstakingly restored by hand, which has made it possible to keep doors, walls and frescoes on the ceilings. On this floor, I would particularly recommend its cosy and supremely elegant reading room, which is classically modern. 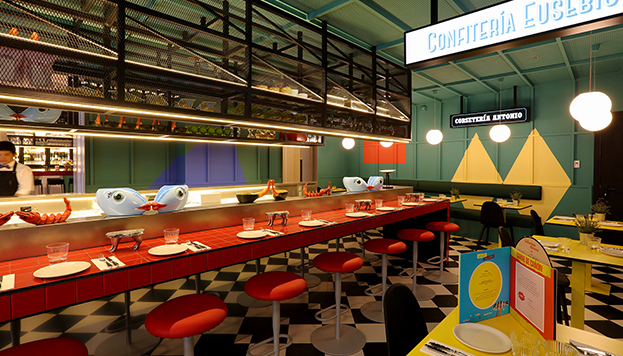 One of the hotel’s great new features is the restaurant: Las chicas, los chicos y los maniquís. 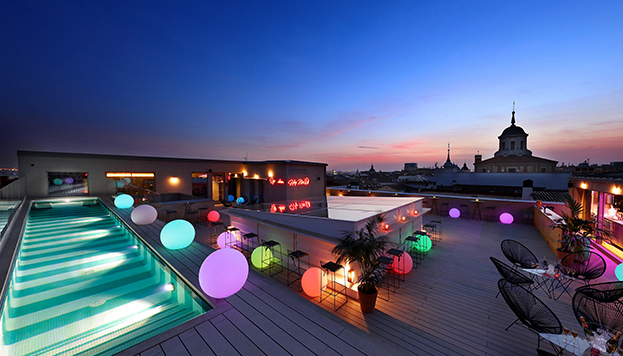 Madrid’s Movida movement is the leading influence behind the design and the gastronomic discourse, which includes tapas and traditional dishes with an innovative twist, served in bold presentations. As the saying goes, “From Madrid to heaven”, but in the case of the Hotel Axel, also to the underworld, as it has a grotto called Bala Perdida (Stray Bullet), a sort of hidden bar where you can carry on after a long day’s sunbathing on the terrace or have a mid-week after-work drink. Something which makes this chain unique is their range of door hangers. Aside from the ubiquitous “Do not disturb” or “Please make up the room”, we will also find a third option, inviting social relationships with a subtle “Please disturb me”. 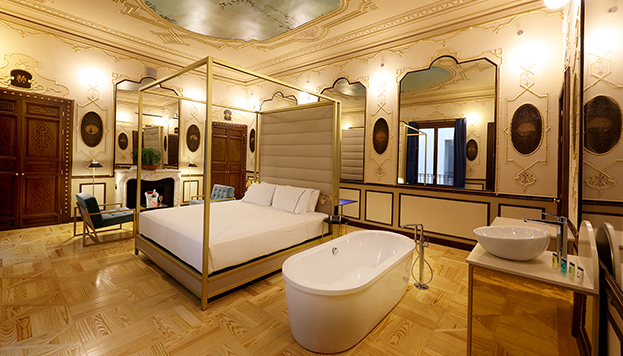 For this is what the Hotel Axel is actually telling Madrid: please disturb me; come on in and enjoy me.